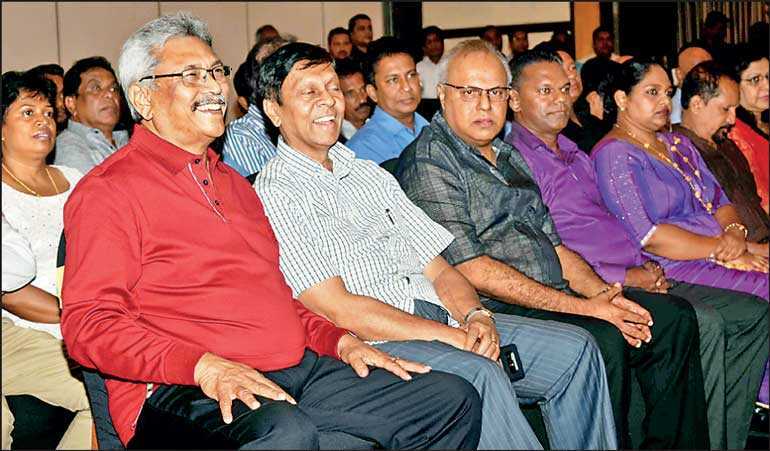 It is no accident that presidential-candidate hopeful Gotabaya Rajapaksa holds his Viyathmaga meetings in bourgeoisie spots. Once, it had been Shangri-La. Last Saturday, 12 January, it had been Waters Edge. Gota’s speech offered nothing to relieve the endemic poverty, pain and suffering of 80% of our people. The thoughts about the poor and downtrodden were distant from his horizon. The one theme that emerged is his Hitler-like will to power. Get to that exalted seat. That’s it. I could identify some of the so-called “Viyaththu” people. Prominently, there were professionals who were rendered jobless and nowhere to go after Mahinda Rajapaksa fell. A few now-obsolete artists could also be identified. Locating a true and respected viyatha would have been like searching for a needle in a haystack; with the exception that the meeting numbers did not look countless as hay does look in the haystack. The erudite and famous of today weren’t there. Perhaps, Waters Edge wasn’t the right place this time. But, then, can a man like Gotabaya hold public style meetings in poor Maha Vidyalaya buildings? The temple of the monk that wanted him to be a Hitler may have been a better choice. Social media has, since, referred to Gotabaya as Gotler! Sri Lankans have a good sense of humour. I did get some Gotler feeling when I read the news report of that meeting in the newspapers. Gota dangerously tread into an area where he has been perceived as being utterly weak, namely, human rights. He made a distinction between social rights and individual rights although such a distinction cried for definition. What drove fear into me was when he downgraded individual rights. Gota went out of his way to state that social rights should take precedence over individual rights! Furthermore, like it had been to Hitler, nationalism is a crucial ideology for Gota. Gota’s suggested acceptance of the institution of the Executive President completed the collaged image. All these considerations bundled together gave me that eerie Gotler feeling. The fact is that social rights are not treated as ‘rights,’ as such. States the Stanford Encyclopaedia of Philosophy: “The Universal Declaration of Human Rights by the United Nations General Assembly in 1948 is now international law. The Universal Declaration included social (or “welfare”) rights that address matters such as education, food, and employment. Their inclusion has been the source of much controversy. Social rights are often alleged to be statements of desirable goals but not really rights. The European Convention did not include them [social rights] (although it was later amended to include the right to education). Instead they [social rights] were put into a separate treaty, the European Social Charter. The general understanding, therefore, is that the listing of individual human rights are adequate without recourse to special mention of social rights. The reason is that an individual human right when collectivised becomes a so-called social right. The right to education is just one example. This is a right that is not normally practised individually. A child has to attend a school for their education and the school is a community. The distinction that Gota makes is thus senseless and his conclusion that one set of rights takes precedence over another is absurd. The distinction makes sense only in a Fascist context. The downgrading of individual human rights by Gota is frightening as that echoes Hitler’s similar public pronouncements. Under the guise of upholding ‘social rights’ as against individual human rights Hitler sent millions to the gas chambers. The social right was to cleanse Germany of the Jews and that social right takes precedence over the human right to life and security of a Jew. Now, what quarrel does Gota have about any of those rights? Why make anything supersede these rights? Particularly in view of our experience under the regime where Gota and his family owned there were and are widespread allegations that many of the above rights had been violated. White vans arbitrarily knocked at homes and carried some to no man’s land. The man who commanded our Army to victory in the battlefield was dragged away and put in incarceration without a Court order. The famed and fearless journalist Lasantha Wickrematunge was denied his right to life and security and no attempt was made by Gota, the then powerful Defence Secretary, to initiate serious inquiry; young ruggerite Thajudeen was brutally murdered and the incident was deliberately dressed by cops in Gota’s charge to look like an accident. Our highest judicial officer was arbitrarily thrown out of her job by a bogus impeachment procedure. The torture of journalists Keith Noyahr and Upali Tennakoon. All these were violations of the human rights mentioned. Perhaps Gota’s guilt is talking. The fact is, Gota has no respect for the individual and that makes his downgrading of individual human rights more scary because that is natural to Gota’s character. When wielding power, Gota showed himself to be full of ego. His lack of respect for the person is evidenced in videos going around even these days on social media. Gota’s interview by the BBC on Lasantha’s murder is a dramatic case in point. “Who is Lasantha?” Gota asked arrogantly as though Lasantha was a piece of rotten fish or what the cat brought in.